With a wooden spoon, mix all ingredients except the dark chocolate in a big bowl. Stir for 1-2 minutes to make sure that the coffee dissolves well into the mixture. I suggest you let the coconut oil melt a little bit before you add it into the mix. Use a cookie sheet that is about 17 x 10 inches. Pour your mix on parchment paper that goes directly on the cookie sheet. Use a spatula to spread the mixture evenly. We don’t want it more than 4-5 millimeters thick. To help you spread the mix, you can pour a little bit of water on the spatula. As you remove the cookie tray from the oven, immediately make 5 cuts with a chef knife on the short side of the pan. If you want to make some curved shaped cookies, you can use 3-4 wine bottles by laying them next to each other. Lay a strip of cookie over each and let them cool. If you want to do cone shapes, you can cut squares into the stripes of cookie and roll them into cones. Either way you will have to let them cool down for about 15-20 minutes before touching them once they are in the desired shape. Heat up a double boiler and melt the chocolate into the top portion on low heat. Use a fork to sprinkle melted chocolate on your cookies as they cool down. 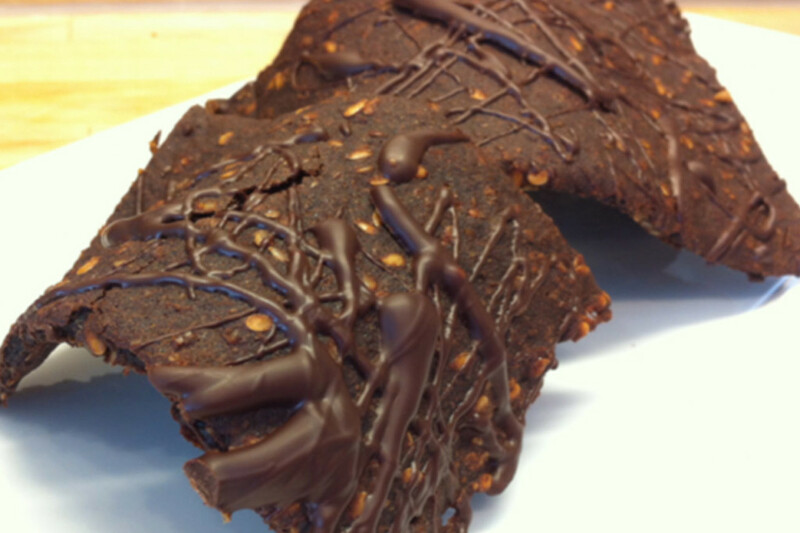 You can serve these with a hot cup of coffee as a guilt free snack. Keep them in the refrigerator for a longer shelf life.